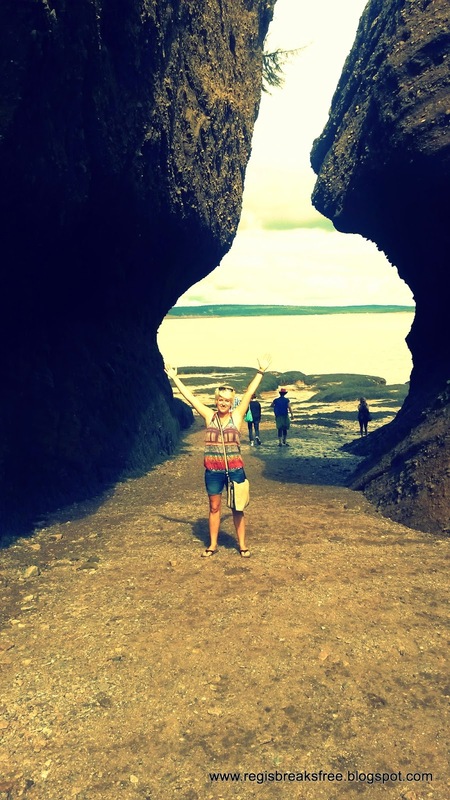 Regis Breaks Free: New Brunswick & the Bay of Fundy! New Brunswick & the Bay of Fundy! I seem to be recounting the tale of our roadtrip in geographical, rather than chronological, order. After Quebec comes New Brunswick. The big item on the "To-See In New B" was the Bay of Fundy, which I'd actually never heard of until earlier that summer when Karissa randomly received some Canadian facts on her phone in celebration of Canada Day. Little did I know that The Bay of Fundy is one of the "Marine Wonders of the World" and it is known to have the highest tides in the world! Right here in Canada! This is me looking extremely happy that we actually made it! Our ambitions to visit the Bay were a little haphazardly planned (ie: I was planning it, not the wonderfully organized Katharina!). I have to say, though, the New Brunswick tourism websites were not helpful in discovering exactly where to go to witness this natural wonder. We thought that we could see the "flowerpot rocks" in St. John NB, so we left early in the morning to drive South for several hours, only to discover at the tourism office that we had literally been an hour away from the national park where we started! That was frustrating! I had to twist a few arms to get everyone back in the car for another long drive back up to Hopewell Cape, which is where you can see the really cool Flowerpot Rocks! (I just saved you hours of research and a failed drive to St. John. You're welcome). On the plus side, our arrival time coincided with the low tide, so we got some spectacular views of the formations and the beach. At it's highest, the tide comes up to 53 feet. Here you can see just how far the beach stretches when the tide is out! It's incredible! It was a long day with lots of driving (really beautiful, scenic driving though- probably my best day behind the wheel), but the Bay of Fundy was totally worth it. I even got a sweet student discount on my pass! Hooray for the ISIC! Walking on the beach and exploring the endless rock formations was really, really, cool and I would go back again for sure. Another really awesome part of the day was randomly running into two friends from treeplanting last year! We had no idea they were in the province, and we were only at the bay for probably 2 hours...the timing just worked out perfectly...what a crazy coincidence! I'm glad you're enjoying it! Thanks for saying hi!